No one wants to see their holiday season go up in smoke. You can avoid holiday havoc by taking extra caution in the coming weeks while setting up decorations and preparing meals. Prince George's County Fire and EMS spokesman Mark Brady has some tips. WASHINGTON — No one wants to see their holiday season go up in smoke. But it does happen. Candles are left unattended, a full kitchen can result in a hot pot or pan falling off the stove, and twinkling Christmas lights, while pretty, can cause electrical chaos. But, you can avoid this bit of holiday havoc by taking extra caution in the coming weeks while setting up decorations and preparing meals. Prince George’s County Fire and EMS spokesman Mark Brady said a little bit of pre-emptive care can prevent accidents and fires. Brady said hot stoves and heat sources are the main causes of fires during the holiday season. Never leave a stove or oven unattended, he said. If you’re using space heaters or fireplaces, make sure they’re in good working order. “Have your chimney cleaned or inspected at least once a year,” Brady said. In addition, consider upgrading to a newer space heater that will automatically turn off if it tips over, and remember to turn them off at night. Inspect last year’s lights before you hang them this year. Check for broken cords or loose bulbs and replace old ones. When replacing lights, look for newer LEDs that don’t get too hot. They also require less energy and come with safety features. “Those larger bulbs, they burn quite hot and if they come in contact with something combustible … certainly that can cause a fire,” Brady said. When plugging them in, make sure only three strands of lights are connected together, then create a new circuit. When ending your night, always turn off your lights. Christmas tree fires “are like an explosion” and spread very quickly, Brady said. If shopping for a live tree, be sure to get a fresh one. “Run your fingers down one of the branches and make sure that the pine needles do not fall off in your hand. If they do, that tree has probably been cut some time ago and is already starting to dry out,” he said. 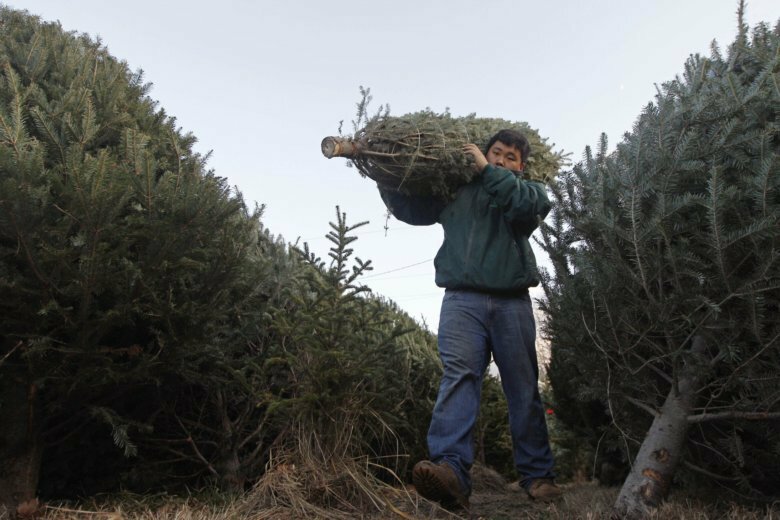 Once you get your tree home, cut about a quarter of an inch off the bottom to ensure it can absorb water and stay moist. Place it away from heat vents and fireplaces. “A dry Christmas tree, with electricity running throughout that tree, is a dangerous, dangerous recipe,” Brady said. Avoid lighting real candles and instead, use battery-powered ones. Open flame candles are a year-round fire hazard. “If you do want to use open-flame candles, make sure they’re in a sturdy base, make sure they’re not somewhere where they can come in contact with anything like curtains, lampshades or any paper products,” Brady said. No matter what time of year, it’s important to be sure your smoke and fire alarms are working. “We highly recommend the use of 10-year smoke alarms,” Brady said. Also, make sure each room is equipped with a working smoke alarm, and when going to bed, sleep with the door closed. “This will give you that extra barrier between you and the fire, and perhaps prevent that heat and smoke from entering the room for a period of time,” Brady said.